Marketing strategies are always evolving to keep pace with customer desires and attention spans. People are inundated with marketing information today through emails, internet ads, events, etc, and it has become so important to stand out from the crowd. Jason Hartman is joined by long-time marketing expert and author, Bill Glazer to talk about how to catch the attention of your intended customers with Bill’s outrageous strategies. The goal, obviously, is to get your messages opened and read. Bill mentions several creative and successful marketing techniques that he employed or that fellow marketers have used, such as a fun, tri-fold placemat that when unfolded, contained a complete sales letter. He encourages making all marketing material and media engaging and compelling with a good story, a good offer, and a deadline. Personalization is another key element. There are many different ways to set up a marketing campaign to launch a product or service, such as webinars, a short series of marketing videos, affiliate relationships, direct response and long-form sales letters, always following the form of a good story, a good offer, personalization, and a deadline. Jason and Bill also touch on the most effective types of guarantees and refund policies. 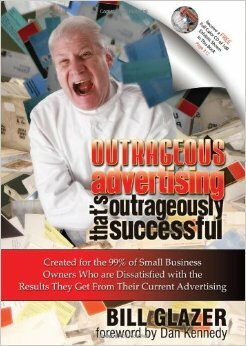 Bill Glazer is one of the most celebrated marketing advisors in the world and bestselling author. . He is best known for his OUTRAGEOUSLY EFFECTIVE direct-response advertising and direct mail. Many of his campaigns have pulled in over one million dollars in sales. Bill and his “Outside the Box” Marketing Strategies have often been featured in the most prestigious Marketing Magazines in the world. Most recently, DM News, which is the newspaper of record for Direct Marketers, ran a feature story on Bill’s Outrageous Marketing Strategies that are Outrageously Effective. In 2000, the industry journal MR Magazine names Bill and his BGS Marketing System to the list of the 100 Top People, Places, and Things Impacting the Industry at the Millennium…the equivalent of being named to People or Time Magazine’s list of the 100 most noteworthy or influential individuals. Perhaps the shining jewel of Bill’s accomplishments was his winning the prestigious RAC Award at the 2002 Retail Advertising Conference. This honor is equivalent in retail as the Oscars are to movies and the Emmys to television. In 2003, Dan Kennedy asked Bill to partner with him to provide marketing and business building advice to both of their list of members that now tops 100,000 worldwide. In 2010, Bill sold Glazer-Kennedy to a Private Equity Company and now works one-on-one with private clients throughout the world. He can be reached through BillGlazerConsulting.com.